Arlington, VA, January 7, 2016 – PBS KIDS has announced the launch of the all-new WILD KRATTS Baby Buddies App, a science-focused app based on the popular animal-themed kids series, now available on iPhone, iPad, iPod touch and Android devices. 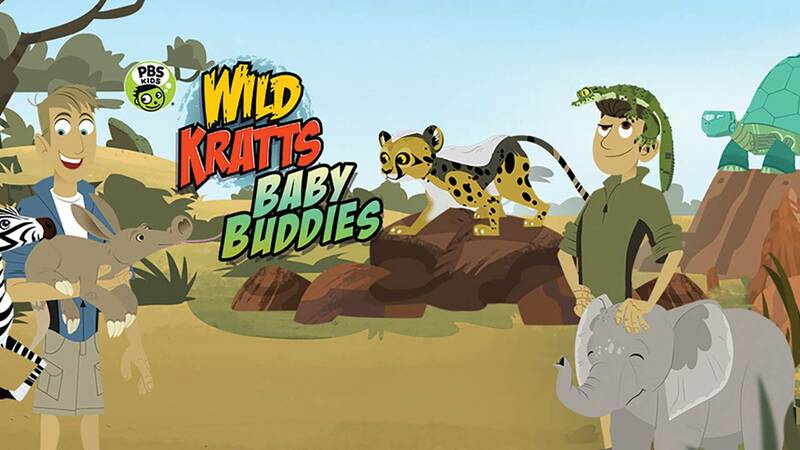 In WILD KRATTS Baby Buddies, kids join the Kratt brothers, Chris and Martin, on an African Savannah creature-sitting adventure, as they help care for baby animals. Intended for children ages 3-8, the app gives kids the opportunity to learn about animal care and science. “WILD KRATTS Baby Buddies is the ultimate app for young WILD KRATTS fans,” said Chris Kratt, co-creator of the family favorite series. “With this new app, and with all of our work, our goal is to make natural history and science fun for kids, through a camaraderie with the amazing animals on this planet,” added co-creator Martin Kratt. In addition to feeding, washing, protecting and playing with the baby animals, the WILD KRATTS Baby Buddies app allows children to discover something new and exciting every time they play. The animals include a baby elephant, cheetah, zebra, aardvark and crocodile. WILD KRATTS airs weekdays on PBS KIDS (check local listings). In each episode, creature adventurers Chris and Martin Kratt take kids and their families along on extraordinary animal-powered adventures. The show transforms the Kratt Brothers, creators of the award-winning Kratts’ Creatures and Emmy-winning Zoboomafoo, into animated versions of themselves, allowing the real-life zoologists to visit wild animals in their little-seen habitats and showcase key science concepts along the way. The series is a co-production of The Kratt Brothers Company and Emmy-winning 9 Story Entertainment. The WILD KRATTS Baby Buddies App is now available for $1.99 from the App Store, Google Play and Amazon stores. Images of WILD KRATTS Baby Buddies can be found on PBS PressRoom. *Source: Nielsen NPOWER K2-8 GAA%, Google Analytics, September 2015.